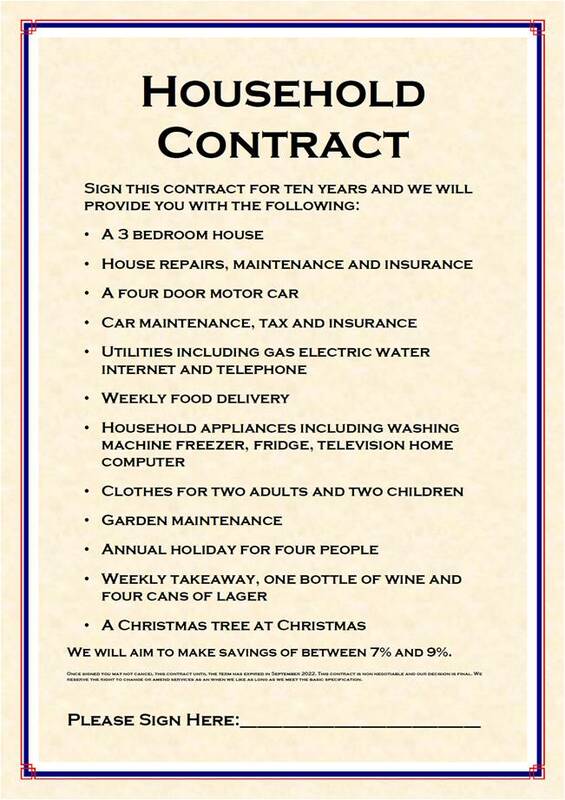 Would you sign this contract. Think about it. Think about how your circumstances might change over ten year. Think about how inflexible this might become.Most sensible people would not sign such an onerous contract. Nobody wants to put all their eggs in one basket and tie them up for ten years. Sadly that is exactly what Barnet Council want to do with the One Barnet Outsourcing contract. This is madness and will only end in disaster. Please get Barnet council to stop this project now. Every month the bill for One Barnet consultants and lawyers continues to rise. The August payments are out and Agilisys have cut back slightly billing only £226,538.27. The Council's legal; advisers Trowers & Hamlins have also billed £106,767.70 making almost exactly a third of a million pounds this month on One Barnet in fees. When the Council have the cheek to tell us that services have to be cut because of the need to reduce costs remind them how much money they have frittered away on professional fees in the last three years on this mad One Barnet project. Imagine that a company you had never heard of said to you, “We will take control of all you major household expenses; we will supply your car; we will deliver your food; pay your utility bills. We will supply your TV, computer, telephone and internet connection. We will pay your mortgage and maintain your house in good repair. We will even apply for benefits you are entitled to and prepare your tax return. Sign up for a minimum ten year contract and make one monthly payment to us for all these services and we reckon we can make savings of between 8% and 10%. Over ten years that's thousands of pounds”. Then ask yourself is that something you would commit to. Of course you wouldn’t. Individually you might get different companies to provides all of these services and some you might do yourself. With this approach you are putting all your eggs in one basket and the risks of it going wrong are huge. Think about all the circumstances that might change, what if you don't like the food they buy when they switch to a low cost supplier. Yes I know they are still teabags but they are the sweepings off the floor and the beef comes from Namibia and the chicken comes from Vietnam. What if they sub-contract out your household repairs to Bill Bodgett & Sons who only do the bare minimum of repairs leaving your house in a much more dilapidated condition at the end of ten years. What happens if your family grows and you need a bigger car- can you change cars? What happens if they sub-contract out the mortgage to a euro provider who subsequently goes bust or whacks up the interest rate? The more you think about it the riskier it seems. This is exactly what the One Barnet project is all about but on a much, much bigger scale. There are hundreds of variables in the One Barnet contract; there are numerous circumstances which could change over 10 years but we will be locked into this contract come what may. That is why One Barnet Outsourcing is a massive risk and one that Councillors should not be taking. Problems at Bournemouth with their consultants - Do we have similar problems in Barnet? "A FULL investigation is to be carried out after serious flaws were revealed in Bournemouth council’s use of consultants. The decision follows an audit report, which revealed that some self-employed staff hired by the council had been paid inflated salaries without proper contracts in place. Perhaps it is about time we had a similar investigation in Barnet? I am a man who is not easily shocked but Brian Coleman's performance at the Budget & Performance Overview & Scrutiny Committee last night was breathtaking in the extreme. We had contempt, insults, denigration, sarcasm and offence in quantities and ferocity worse than anything the Simon Cowell, Gary Barlow or Craig Revel Horwood could ever dish out. It left many incredulous and others shell shocked. I came away with the clear impression that Barnet Council was in meltdown, senior officers were intimidated cabinet members were humiliated and the gulf between officers and members is immense. Public questions: Mr Coleman clearly has no respect for members of the public. Each public question was treated with complete contempt, no sensible answer given, supplementary questions simply ignored. One person asked about the Council's "New Relationship with the Citizen". Last night demonstrated with crystal clarity exactly what that relationship is; disdain, derision and disrespect. Cllr Coleman might as well have just held up a sign saying P*SS OFF RESIDENTS because that is exactly how we were treated. There was scrutiny of a report on Early Interventions for troubled families. Cllr Cornelius said that the hope was that by early intervention it would help people to lead better, happier lives. Cllr Coleman's response was "I don't care how people lead their lives as long as they don't break the law and don't cost anything". In other words stuff the disadvantaged as long as it doesn't cost anything. Alison Moore raised serious concerns that this was actually all about saving money and the cuts will make matters worse. Cllr Coleman grilled the officer repeatedly to the point that I almost felt sorry for him. Robert Rams was up next. I had asked a series of questions about the wasted money on yet another consultants report. They have messed about for a year to come up with five options which we all knew about three years ago. Cllr Rams confirmed a response to one of my questions; yes selling off all the council's leisure centres is an option they are considering - People can exercise in the park if they want to get fit. Cllr Coleman ridiculed the outdoor gym equipment in the parks saying they were nonsense. I've used the equipment - yes me use gym equipment - and actually in Oakhill Park there is often a queue to use the equipment because it is accessible and free to use. In the future it looks like that will be the extent of leisure provision in Barnet. We then had a long session scrutinising the budget holders. This is where Cllr Coleman wreaked revenge on his former cabinet colleagues. None were left off lightly. Sachin Rajput was on the receiving end of cross examination for a change forced repeatedly to confirm his confidence in his budget. Poor old Dean Cohen was challenged about the parking charges. Pam Wharf picked up the question about the parking budget and if it was under budget. "the account is in surplus". Ah ha, not what you were asked. Cllr Coleman persisted eventually squeezing out of Ms Wharfe that yes the parking budget was under budget. Oh dear! Dan Thomas really did take a beating and to be honest I did wonder at one stage it it was gong to come to fisticuffs. The animosity between Thomas and Coleman was palpable. I had been trying to think what this meeting reminded me of and then it came to me in a blinding flash - Monty Python's sketch "No one expects the Spanish Inquisition". We then moved on to the massive outsourcing contract for development and Regulatory services. Cllr Coleman wanted to know whether the council were going to enter into a joint venture with bidders. Richard Cornelius looked pretty cross. I have seen no papers about a joint venture and I would need a deal of persuading. The question was asked again and again and the response was clear form Cllr Cornelius no decision has been made. Everyone in the public gallery was willing the Labour group to ask the question "well why did Pam Wharf send not one but two emails telling council staff they were going for a joint venture and why did Cllr Thomas support that view in the Barnet Press. Sadly the ball was fumbled and the question attempted by Cllr Mittra was not pressed home. Cllr Coleman made a defining, if somewhat crass, comment when he summed up Richard Cornelius' views on a joint venture, " If I were a gambling man, which I am not, I would bet the Icelandic Bank money on us not having a joint venture". In one move Cllr Coleman killed off any prospect of One Barnet being a joint venture once and for all. It was clear at this stage the gulf between officers and Councillors is immense and on the One Barnet Outsourcing they are on two quite separate tracks. "Officers have been closeted with the bidders". That is a deeply unhealthy position and I think there is a very real risk that officers have become far too close to the bidders to retain their objectivity. Cllr Thomas said that a joint venture was the suggestion of the bidders. That should have set every single alarm bell ringing in anyone with a sense of objectivity and common sense but when you have such a close relationship with bidders perhaps certain individuals have lost sight of who they are supposed to be working for. The meeting drew to a close and Cllr Coleman was out the door. There were a lot of huddled discussions and a sense that something quite special had happened. I have a feeling this meeting will be remembered for a long time in the future and definitely not for the right reasons. Today was the second meeting at Friern Barnet Library between, the squatters, community representatives and council officers. Sadly neither Cllr Rams or Thomas were in attendance. Craig Cooper, the council's commercial director was replaced this week by Bill Murphy who is in charge of libraries. The meeting kicked off with a statement from Phoenix that he and the other squatters want a properly run and resourced library, a statement which I personally was very pleased to here. He then said that the New Carnegie Foundation may be willing to help provide funds towards keeping the library open. Keith Martin, who has been a long time community campaigner for the library, also read out a statement he had received from Carnegie UK saying they hoped the library could be kept open. During the discussions Bill Murphy made the point that the Artsdepot Landmark Library may or may not go ahead something which came as a shock to most of those present. He also noted that although they had saved £300,000 so far there was still another £1.1 million to be saved. The one thing he did do was clarify that actually it doesn't matter how little the Friern Barnet library could be run for, it still doesn't matter because the council must sell the library to fund investment in other libraries. So there you have it. 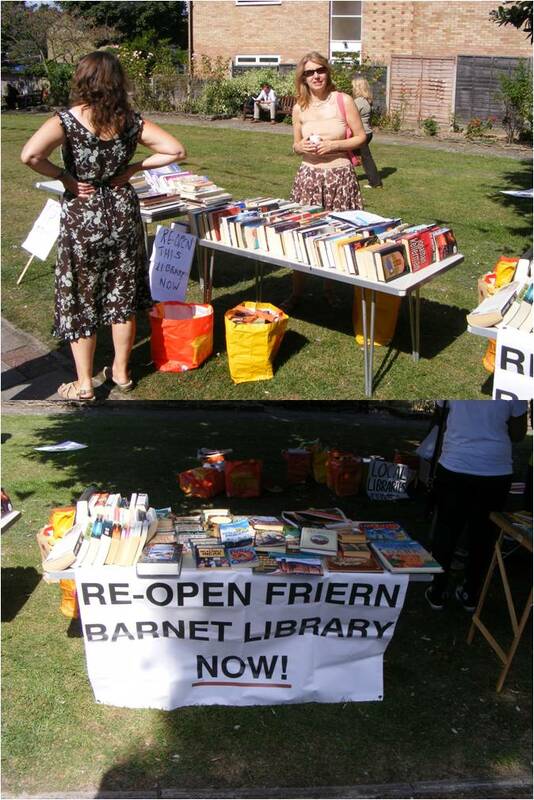 Friern Barnet Library is being sacrificed to fund improvements in other libraries. That seems awfully tough on Friern Barnet residents. Roger T of the Barnet Eye then discussed the elephant in the room. "Are the council still pursuing the eviction proceedings?" Julie Taylor seemed to hedge around the subject but didn't deny proceedings were still going ahead. After some discussion from Phoenix, a promise was made by Julie Taylor that the officers would at least report back the request to suspend eviction proceedings. We will have to see what happens in court tomorrow. Dr Julia Hines suggested that in order to save money now, the council should shut the temporary library at the Artsdepot. Although it is costing around £34,000 in rent, it is getting only between 4 and 5 visitors a day whilst the squatter library is getting 50 -70 people a day and costing the council virtually nothing. Eventually the meeting finished but I remain left with the clear view that Barnet will off sell Friern Barnet Library no matter what alternatives are proposed or residents want and that is nothing short of a disgrace. Today there was a polite and good natured lobby against One Barnet outside Chipping Barnet Library. The lobby group of BAPS members had set up their table next to the bench outside the library. These are not anarchists or trouble makers. They are decent respectable people who are seriously concerned about the massive £1 billion gamble the Council is taking by outsourcing 70% of the council's services to private companies. Sadly the library summoned the Police and two PCSO's turned up.They instructed the Baps supporters to move the table from the safe and wide path leading to the library to the narrow pavement all of 6 feet away. The Lobby then went in to present a report to Councillors holding their Saturday morning surgery. BAPS are doing a great job of informing the public about what the One Barnet outsourcing programme entails. It just amazes me that Barnet Council feel they can impose such a radical plan without explaining any of the details to the residents they are supposed to represent. Sadly we have an oligarchy in Barnet with a handful of people who think they can impose their misguided will on all 350,000 residents without any opposition whatsoever. Well I'm sorry to tell you Barnet but the residents aren't a push over. I attended a meeting this morning at Friern Barnet Library. In addition to a dozen local community representatives and three other bloggers, (Mrs Angry, Barnet Eye and Barnet Bugle) there were four staff from the Council, Craig Cooper, Julie Taylor, Heather Wills and Mike Fahey, and two Councillors, Pauline Coakley Webb and Arjun Mittra. There are no pictures as council officers preferred no filming. Phoenix, who leads the squatters, took the role of meeting facilitator. We had to raise out hands to speak, put up two fingers for a direct response and do a bit of jazz hands if we wanted to applaud something. So for an hour and a half there was a very polite and orderly discussion. However, to my mind one thing was blindingly apparent. The officers had absolutely no authority to discuss Friern Barnet Library. Julie Taylor was quite clear "Friar House is the only solution". On hearing that statement a few people seemed somewhat taken aback and I wondered if it would all kick off. However a lid was kept on proceedings. The Council are pushing the option of the library moving into Friary House because they hope it will secure a future for that building. Well hang on a minute, what about the charming and exceptionally accessible Friern Barnet Library. Irrespective of all the perfectly sensible and wholly rational arguments put forward by the local community for keeping open Friern Barnet Library their voice just isn't being heard. The only two people who can change that situation are Councillors Dan Thomas and Robert Rams and neither were present. Craig Cooper said that the potential capital receipt from the sale of the library would be in the region of £430,000. To set that in context, the annual budget of the council is over £900 million so the sale of the library is a drop in the ocean. It is the equivalent of £1.25 per Barnet resident. We all chipped in £20 a year for ten years toward the Olympics so why not a one off £1.25 for the library. What is clear now is that the squatters are in place and the library will reopen to the community but only as an all weather version of the pop up library and only in the short term. 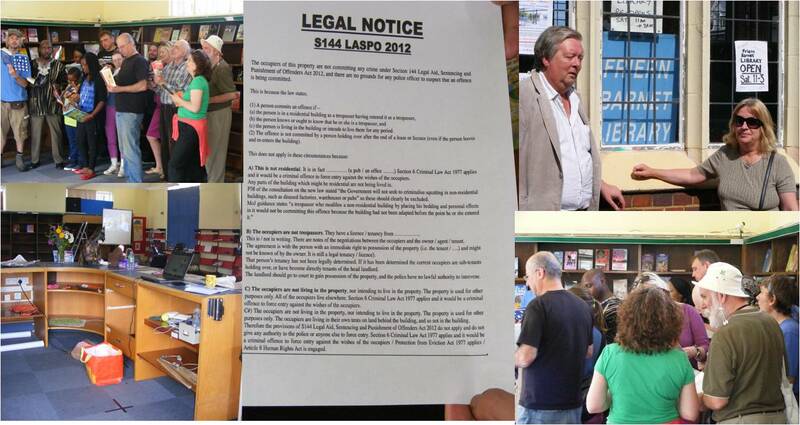 The community deserves a proper library, well resourced and managed for the long term. After the meeting someone said to me that whilst there was dialogue there was hope. Sorry but my view is the council are stalling for time and as soon as they can market the property they will flog it. Friern Barnet Library-What is the Council up to? 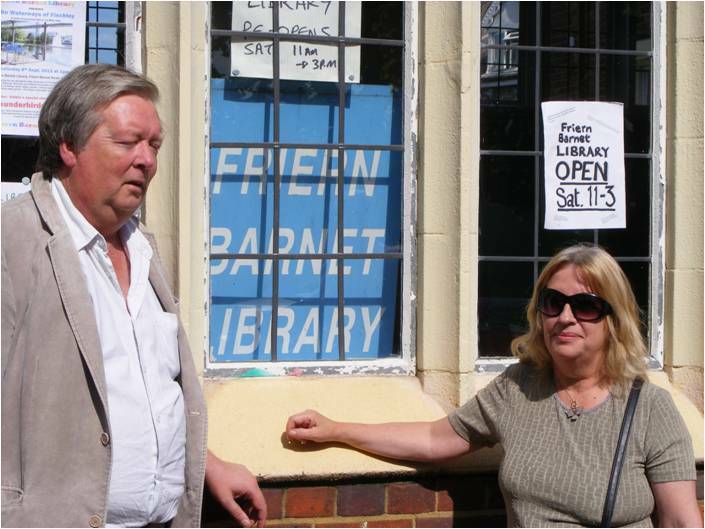 Yesterday I paid a visit to Friern Barnet Library to visit the campaigners and get sight of the squatters who have occupied the vacant building. Frankly, when I read in the on line version of the Barnet Times that Barnet Council had immediately offered the squatters an opportunity to take over premises at Friary Lodge, I thought it must be a joke. 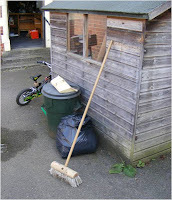 However, in Barnet, reality is often stranger than fiction and sure enough the leader of the squatters, Phoenix, not only told us about the offer but read out a long email from the council setting out their conditions. There is a meeting tomorrow (Monday) morning at 10am between the squatters and senior council officers to talk further. Now I'm sure Phoenix and his comrades are jolly nice people and they have been clean and tidy but they are not Barnet residents or Council taxpayers. The honest, genuine and law abiding and council tax paying local residents who form the Save Friern Barnet Library Campaign have been ignored completely by the Council. Personally I find the Council's approach to this situation utter reprehensible but what is does show is that being reasonable with the Council doesn't work and that direct action pays. I think the Council have made a fundamental error of judgement that will copme back to haunt them, but there again that comes as no surprise whatsoever. Local Labour Councillors, Pauline Coakley Webb and Barry Rawlings were in attendance but remained outside the Library. Other campaigners came inside to see what was going on. Seeing the empty library in the heart of the community that could be use now whilst the £35,000 broom cupboard up at the Artsdepot, is nothing short of tragic. It is quite clear the Council has turned it back on the people it should be listening to. The Council shouldn't therefore be surprised when, at the next election the local, decent, community spirited people of Barnet turn their backs on this utterly rotten Conservative regime and vote them out. Will One Barnet end up like SouthWest One - Yes and it terrifies me! Oh dear, it has not been a good week for Local Authority outsourcing. South West One published their accounts showing that the losses are still being racked up. You can download them here. It records that 136 staff were transferred back to Somerset County Council. The accounts record that in the five years that the Joint Venture has been in place they have realised savings of £13.4 million. Not bad you might think until you read that the retained losses amount to £43 million and that IBM have capped any further liabilities at £10 million. Worst of all the directors' statement records that "The company is currently in dispute with the joint venture partners on a number of matters". Following a mediation on the 4th and 5th of July, "no settlement has been reached and accordingly the board will be reviewing which of the remaining options in the contractual procedure should now be pursued." Tonight on the BBC it has been announced that South West One is launching legal action against Somerset County Council. Today also saw Cornwall Council vote against a massive outsourcing programme with one councillor stating that "much of the evidence used to support the joint venture was pure conjecture". The big issue here is with one of the most prominent large scale outsourcing JOINT VENTURES going wrong why on earth are Barnet Council so determined to repeat the mistakes of others and move to a JOINT VENTURE model without any debate or discussion.. I have read the Barnet Council Audit Committee papers this evening and there seems to be no mention of any risks associated with the £1billion One Barnet outsourcing project. Are the council in denial, are they badly advised or are they paralysed in the headlights of this monster and unable to move? Who knows but one thing is for sure unless this madness is stopped now, every single resident is at a massive financial risk. Imagine the scene. You want a loft extension for your house. You employ a builder but to safeguard your interests you also employ a project manager. “How much will this extension cost me” you ask the builder. “Approximately £20,000” says the builder. “OK”, you say knowing that the project manager will be keeping an eye on the bills. Eight weeks later the loft extension is still only half built and you are presented with a bill for £40,000 on account. Turning to your project manager you say," Hang on a minute, I thought it would be approximately £20,000 but it’s double that and it’s still not finished". “Yes”, says the project manager “but it wasn’t a fixed quote and they are lovely people”. You leaf through the invoices and there are bills for gardening work, resurfacing the driveway and hosting a barbeque for your neighbours. “Hang on a minute,” you say, “what is all this for”. "Well" says the project manager “it didn't cost that much and it needed doing so while they were here I thought I would just get them to do the work ”. Now I know this sounds like an implausible story but is very similar to the one being played out in Barnet right now on the One Barnet project. Back in July 2010, Councillor Dan Thomas signed a Delegated Powers Report awarding the Implementation Partner Contract for a three year period to Agilisys working with iMPOWER. The value of this contract was in excess of £500,000 in the first year of delivery with circa £2,000,000 identified as potential contract delivery cost over a three year period. In the last two years Agilisys have billed over £3.5 million and, at the current run rate of £275,000 a month, is likely to hit £6 million by the end of the contract next year. So Councillors were told it would cost "circa" £2 million it is already almost double that figure and by the end of the contract period will possibly be treble the figure agreed. To his credit, Councillor Jack Cohen queried this contract at the Business Management Overview and Scrutiny Sub Committee in September2010 and as a result (and if I recall correctly, with the key vote of Councillor Mark Shooter) the Committee referred back the contract “to the Cabinet Member for Resources & Performance (Councillor Thomas) for reconsideration with particular reference to the precise role of the contractor and overall cost of the contract”. Councillor Thomas subsequently decided to “retain the original decision without amendment”. In other words P*** Off! Part of the money paid to Agilisys was to develop the Council’s new website which was outside the scope of the original contract and therefore potentially in breach of EU procurement rules. Now, I’m not sure what I expected in reply from the auditor but it certainly wasn’t the response I received. So Councillors, there you have it. By adding the word “circa” to the estimate of costs it means that officers can spend what they like and they have no constitutional requirement to report back to you when it goes massively over budget. I wonder how the members of the Business Management Overview and Scrutiny Committee feel about this statement. They queried a contract that they were led to believe would be “circa” £2 million. Maybe an overspend of £100,000 or £200,000 might be acceptable within the term “circa” but given this contract may end up costing £6 million, I do not think that could be reasonably viewed as circa £2 million by any normal person. But the auditor says it’s OK, so tough luck. So how comes it takes an ordinary member of the public to get the auditor to talk to officers to draft a report updating councillors that a contract is millions of pounds overspent? Is it something the 63 councillors paid just under £1.1 million a year should be doing? Is it something the Chief Executive paid £200,000 a year should be on top of? Either way it shouldn’t be down to me. On the second point about Agilisys being given work to develop the council’s new website the auditor was, in my personal opinion, equally dismissive. I set out quite clearly that the Implementation Partner was awarded the contract on something called a framework agreement. This is a central government agreement with a number of suppliers for specific services and alleviates the need for councils like Barnet to go to a full open tender. The implementation partner contract was let on a framework for BusinessConsultancy Services for which Agilisys is an approved supplier. I know it was let on a framework agreement because back in 2010 I specifically asked a question about it. There is a completely different framework agreement for Website Development lot 6, for which Agilisys is not an approved supplier. “The element of spend that is with Agilysis is on business consultancy associated with the customer services transformation which is clearly a wider project than just website redesign. It makes sense that consideration of the website be dealt with as an integral part of the wider customer services project. I note that the technical element relating to pure web design included in the business case document is a small proportion of the overall project budget. We therefore propose to take no further action in respect of your contention that this arrangement breaks EU procurement law. We remain of the view that no compelling evidence exists to suggest that this transaction represents expenditure which is outside the Council’s powers and for which we would seek legal advice”. Given that Agilisys have been paid more than £300,000 specifically for the website development and this is above the EU procurement threshold, then in my humble opinion the fact that it is a “small proportion” of the £3.5 million paid to Agilisys to date is irrelevant. I have reached an impasse in my dealings with Grant Thornton and I really wonder whose side they are on? I do not do this for political motives as I am not a member of any political party. I do this because I am a resident of Barnet and am utterly fed up with the cavalier way residents’ money is being spent without adequate regard for the checks and balances that I would expect to be in place. As a disillusioned resident I have no confidence in the officers and the way they spend our money, I have no confidence in councillors keeping the officers’ spending in check and I am rapidly losing confidence in our external auditor to take issues like this one seriously. Something is deeply wrong in Barnet and if this attitude is replicated with the One Barnet contract, I can see the residents being right royally ripped off with absolutely no comeback. It must be a challenging task to make decisions on behalf of all the residents in the London Borough of Barnet. These decisions involve so many areas of our lives – education, social care, health, housing, the environment. It must be even more difficult at a time of austerity when you are forced to make such difficult decisions about how to spend our money wisely and to the benefit of all of us. responsibility it must be to make such a huge financial commitment on our behalf. residents and council employees, have voiced concerns, but there seems to be a great reluctance on the part of representatives of Barnet Council to discuss or reveal details about the One Barnet programme of privatisation, despite residents, Unison and the Association of Public Services Excellence inviting them to attend discussions on the implementation of this programme. Have all of you been given the information needed to understand the impact of the privatization plan? Have all of you had enough time to debate the issues and difficulties in effective implementation of this plan? privatisation is found to be unfit for purpose? If, as part of the privatisation programme, 70% of council employees become employees of a commercial company, how many staff will the Council retain to help put things right if or when something goes wrong? We, as a group of residents, voters and taxpayers, are not satisfied with the proposed privatisation of services, as we believe the quality of our services will diminish. Ask yourselves this question: you will no doubt put the interests of the residents you represent first, but will a private company be concerned about our best interests as much as the interests of their shareholders and making a healthy profit?